Nature designed the wheat kernel as one of the most complete foods, full of vitamins, mineral, fiber and protein. Ancient scriptures called it the “Staff of Life”. Whole grain wheat bread is one of the few foods which has an entire compliment of B vitamins and is extremely rich in vitamin E. The wheat germ is one of the richest sources of vitamin E which has been shown to be important in heart health. Modern day milling techniques has sifted the bran and wheat germ from the flour resulting in a dramatic decrease in the nutrition of the flour. vitamins and dozens of other nutrients from the wheat kernel. 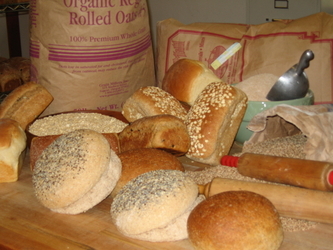 Health officials urged the mills to return to producing whole grain flour again but instead they chose to “enrich” the flour with vitamin B.
Farmhouse breads are rich in the full nutrients of the whole grain wheat and they taste great!